Over winter 2018-2019 the club’s had a couple of trips to South Wales and I’ve had the pleasure of attending both. I’m naturally a Yorkshire caver by dint of physical proximity and since joining the NPC I’ve mainly delved into caves in Yorkshire and France. I know next to nothing about South Wales – but the region has made a case for itself recently. 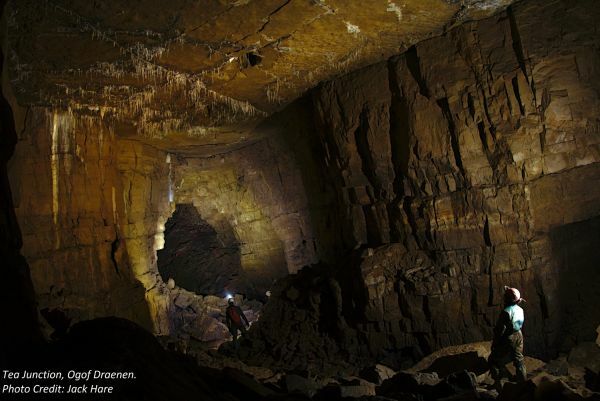 At the end of November ten members descended on the Chelsea Speleological Society’s home at Whitewalls on the Llangattock escarpment. Two more people, who are NPC members but live and cave locally, joined us in the morning. For me the weekend had one major objective: Ogof Draenen, the only big UK system left for me to visit. For others the objective was Daren Cilau. Draenen is unfortunately a cave that at this stage seems unfortunately to be known more for its politiks than for its formations or passage. Nevertheless it was easy to get a permit and a key and ably guided by Trig and Clive, seven of us slithered through the damp entrance passages of Draenen down to Cairn Junction. Four of us were new to the cave and happy to just have a look around, hopefully in preparation for further trips in the future. We headed off on our first recce to Megadrive, ticking off named passages in order: Beer Challenge, Carpet Crawl, White Arch Passage, Lamb and Fox Chamber, Indiana Highway, and Megadrive itself. At the corner with The Nunnery we turned around and tried to remember the way back. Back in Lamb and Fox Chamber we stopped for photography and identified our second recce: Gilwern Passage. To get to Gilwern we passed Carpet Crawl and instead carried on into Tea Junction. After more photography and being suitably impressed by the size of Tea Junction we headed downstream and then up a large slope instead of following the streamway off to the left. Up the large slope lead into Gilwern Passage where we were even more impressed by the formations. The passage was a change of character from the boulders of White Arch and Megadrive. It gave a nice conclusion to the trip and we headed out to a windy night on Pwll Du, interest in Draenen piqued. On Sunday a group went to Craig a Ffynnon for a classic Sunday bimble to the Hall of the Mountain King. Another classic trip I’d never done! And again, the key and permit were easy enough to get (although it’s still a faff compared to the easy access of Yorkshire). Craig a Ffynnon was well worth it too, despite it being pretty muddy. Travertine Passage is wonderfully decorated and the Hall of the Mountain King itself is an awesome reveal. The far reaches of both caves wait for another time. I for one am eager to go back in coming years. A couple of wintry months passed, a new year dawned, and a weekend trip staying at the South Wales Caving Club in January arrived. Four of us went along to Penwyllt, meeting Clive there. He had his SWCC hat on – a good thing, as again he was by far the most knowledgeable about the caves we’d be visiting, this time Ogof Ffynnon Ddu. It had rained heavily on Friday so a trip involving much streamway was not safe. Instead we went into OFD 1 and familiarised ourselves with the flood escape route to/from Lowe’s Chain via the Rawl Series, Helter Skelter and the Bolt Traverse. We weren’t the only ones – there were about a dozen of us milling about at Lowe’s and following one another around Roundabout Chamber in the end. We also visited the Step, photographed some nice curtains, and got to quiz the main member of the SWCC himself about the in-situ monitoring of the streamway that the club is undertaking. I was pleasantly surprised by how pretty OFD 1 is and had to ask myself why I’d never been before. Can’t answer that question but I hope I’ll go back soon enough. On Sunday we were still suspicious of water levels in the streamway. It transpired that the day before, a group of SWCC elite had gone into OFD 2 and rigged the Skyhook, a pitch that leads to Upper Great Oxbow passage. SRT, in Wales? Although such a thing is possible, I had not expected it to be on the cards. 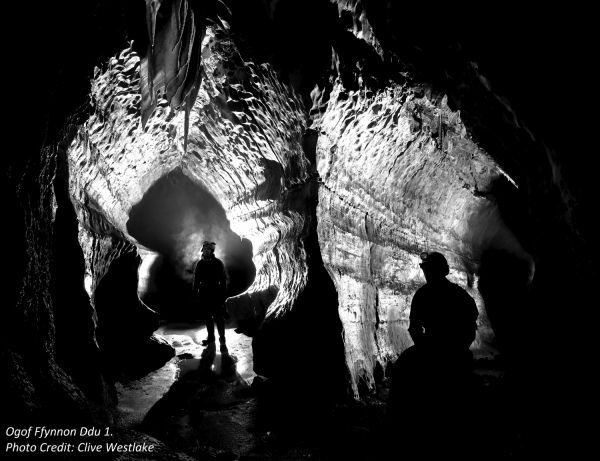 But it made some kind of sense to take advantage of a pre-rigged pitch to a reportedly beautiful bit of cave passage. And beautiful it was! After adventuring (read: following Clive while looking at the survey trying to match where we thought we were to where we actually were) across “the slipperiest boulders in South Wales”, down the Corkscrew, along Salubrious, through the Maze, along Cross Rift and to Midnight Passage, we arrived at the bottom of the pitch. I eagerly nipped up and then spent ages placing an assortment of slings around stal bosses at the top to protect me from falling down again. Eventually I made it off the rope safely and everybody else ascended the pitch. We took off our SRT kits and ooh-ed and aah-ed over the formations in Upper Oxbow. It never stopped being pretty. Even a non-photographer like me could easily spend hours up there photographing the formations, although no photos were taken on this particular trip. After realising we’d dallied for a bit too long enjoying the fine decorations, we headed for the exit. We surfaced after a really pleasant few hours underground. In fact all of these trips were pleasant and satisfying sojourns underground. I have to thank Clive for willingly showing me about throughout, and Trig too in Ogof Draenen. I would have been lost - literally - without them. I’ll be pushing for more trips to South Wales – and maybe not always in the chilly wintertime either!